Your Art & Photos Face Mounted To Acrylic. Highest Rated For 10+ Years. 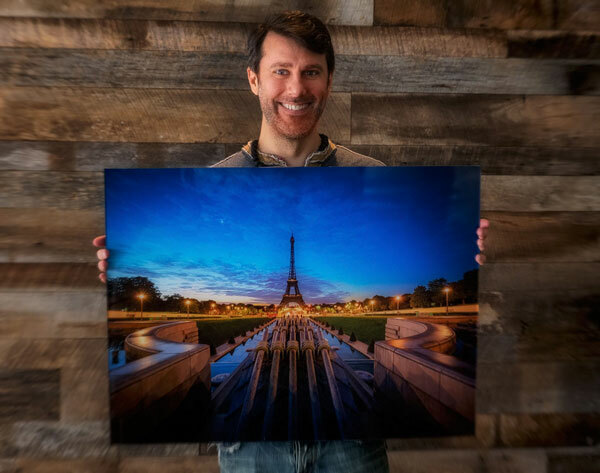 Our acrylic prints for the wall (also known as plexiglass) are handcrafted 100% in-house (USA) using the original face mounting method for superior color and vibrancy. 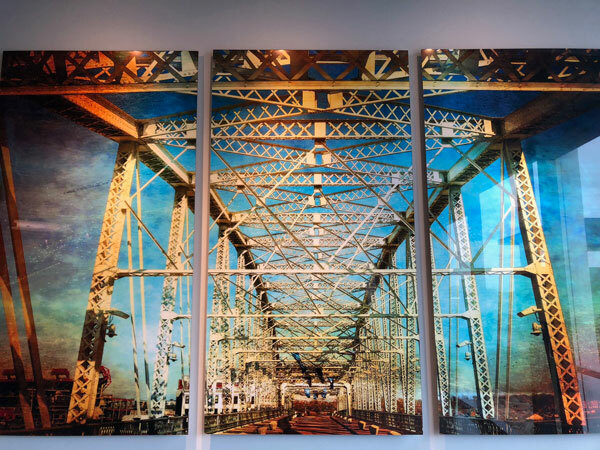 We were one of the first companies in the USA to offer gallery quality acrylic prints and continue to have the highest customer satisfaction rating in the industry. Our guarantee is 100% happiness on every print. We look forward to transforming your photos into stunning acrylic art. The frameless acrylic face mount offers an incredibly modern and brilliant display that no other presentation can match. There are few companies in the world who do it and do it well. 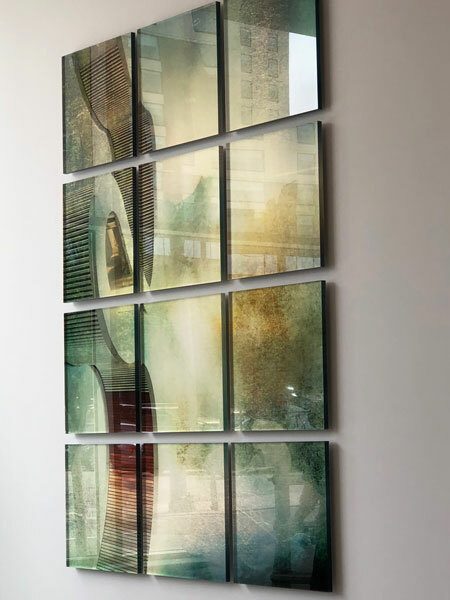 Unlike traditional glass, where light simply passes through, the light refracts within the acrylic creating tremendous vibrancy particularly when paired with metallic paper and overhead lighting. Any Size, Lots Of Options! In addition to the 1/8" and 1/4" thick acrylic, we now have 1/2" and large 1" acrylic blocks. TruLife and anti-glare acrylic prints are available in 1/8". We can create any size up to a massive 96x48" in 1/4" increments. 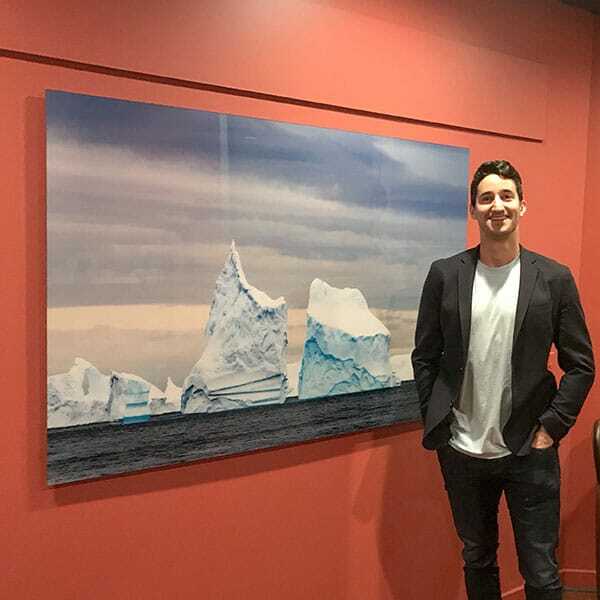 Your photo is printed on high-grade photo paper (satin or metallic), then face mounted to the acrylic glass so you're looking through the acrylic at your print. Acrylic is unique in that light refracts within the acrylic (instead of passing through as it does with glass) resulting in an almost backlit appearance with the right lighting. Your print is backed with providing protection and rigidity and finished with hanging/floating hardware for that floating off the wall look. 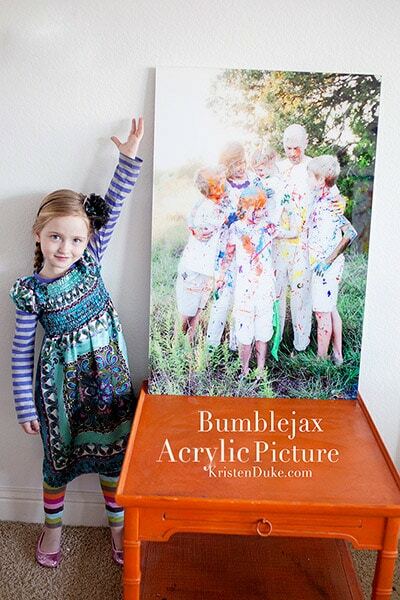 The acrylic face mounting is a difficult process, but at Bumblejax we only offer the highest quality and craftsmanship. Every time. No exceptions. Our pricing includes “gallery quality”. Some labs may charge extra for gallery quality or provide a disclaimer of imperfection which includes noticeable dust specs and bubbles. Since there are a ton of ways to produce these all with varying levels of quality, be sure to check out our detailed buyers guide. Configuration Options: Expand Each Section For More Details. Acrylic Type: Standard, TruLife & Anti-Glare Acrylic. All of our acrylic is clear cast and of the highest quality for face mounting. We do offer an upgrade with the TruLife acrylic in 1/8″ thickness only. It offers glare reduction, scratch resistance, anti-static properties and better UV protection (99% vs 75%). The cost is considerably higher over our regular acrylic and most popular with resellers such as photographers. NEW! We now have an anti-glare acrylic with minimal degradation in vibrancy. This is also limited to 1/8" thick acrylic. 1/8″ - all acrylic types available up to 96x48" in size. 1/4″ - standard acrylic up to 96×48″ in any custom size. 1/2" - standard acrylic up to 40x30" in any custom size. Acrylic Thickness: 1/8, 1/4, 1/2, 1 Inch Thick. We offer the acrylic in 1/8″, 1/4″, and 1/2″ thick. We also offer 1″ acrylic blocks in limited sizes and there is a separate product page for those here. Generally, the thicker you go, the more vibrancy and depth you’ll achieve, but all products look terrific. In the image there you see the 1/2″ on top, then 1/4″ and 1/8″. Acrylic Edge Option: Routed/Sanded Or Diamond Polished. Routed/Sanded Edge: This option is included in the base price of our acrylic face mount product and provides a nice finished edge, just more opaque than the polished edge upgrade. Diamond Polished Edge: The upgrade option here is for a diamond polished edge with a completely smooth, see through edge. TIP: With thicker acrylic the polished edge becomes more important. So, with the 1/8″ we don’t feel it’s all that necessary. It is recommended with the 1/4″. It is required with the 1/2″ acrylic and 1″ blocks. It’s the combo of the thicker acrylic and the diamond polished edge that gives the piece a really cool 3D effect. We offer a Diamond Jet Photolustre paper which is a very nice paper and included in the base price of all our products. While it’s a fine choice for any photo, the metallic paper upgrade (see below) is a terrific upgrade for many photos. The satin/lustre paper is typically recommended with photos where people are the focus (ie. family portraits) as well as softer, less vibrant images. We offer the best pigment inkjet metallic paper available which is the Lexjet Sunset Metallic paper. This is a nice upgrade for photos that are bold and vibrant and offers a bit more depth and pop to the image particularly when combined with the acrylic product. Note: We are often asked to provide an image showing the difference between the two, but it’s impossible to capture on a camera. If you’re uncertain, contact us for a consultation and/or consider ordering a couple small paper proofs to see the difference. While the floating/hanging mechanism won’t be seen once the art is on the wall, some like the more elegant look of the aluminum subframe. Kiln dried doug fir wood floats your art 3/4″ from the wall and included hanging wire and drywall hook allow for a quick 1 minute install no tools required (most popular). Use the calculator to the right to quickly price out your acrylic print. To place an order online for sizes 40x30 and below please use our easy upload and configure system. For larger sizes, please contact us below with your size and acrylic specs and we'll respond with a file upload link and a quote with shipping cost. 1. Prices in the calculator don't include any discounting you're eligible for. We have a nice first order discount and for resellers ongoing discounting on every order. 2. Prices in the calculator don't include the shipping cost. 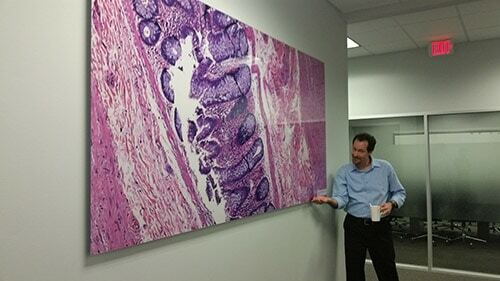 This cost is 10% of the product price for 40x30" and below and gets more expensive as you go larger. It depends on size and shipping location. * The standard ground shipping price is 10% of the product price for art 40x30" and below and is fully insured by us. You'll see a ground shipping estimated time map at checkout. Generally, West Coast shipments are 1-3 business days, Midwest 3-4 days and East Coast 4-5 days. * Expedited shipping is available for 3 day, 2 day and overnight. * Shipping to AK, HI or Canada is 20% of product price + $10. * Shipping anywhere else in the world is generally 35-50% of product price. * While we take great care in how we package your art, shipping damage can occur (quite rare). It's very common in this industry for companies to only replace your print once the shipping company reimburses them. This can take weeks. We don't play that game! Each package is fully insured by us. If any damage occurs we replace it immediately. Just take a few pics of the box and the print. No need to send it back. * All standard stocked sizes ship out in 4-5 business days. Custom sizes ship out in 6-8 business days. Larger orders over around 15 prints, may need a day or two longer. * A Rush Order option is available for 25% (15% for resellers) of the product price and gets your order out in 1-2 business days. Want Product Updates? Exclusive Specials? Tips For Great Prints? FAQ - Your question may be answered here first! 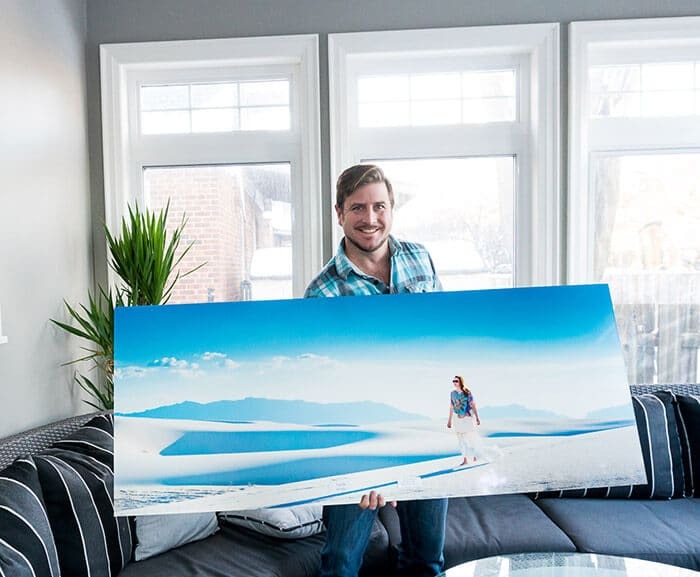 How Large Can I Produce An Acrylic Print? You can place an order online (Order Tab to right) for any size 40x30" and below. 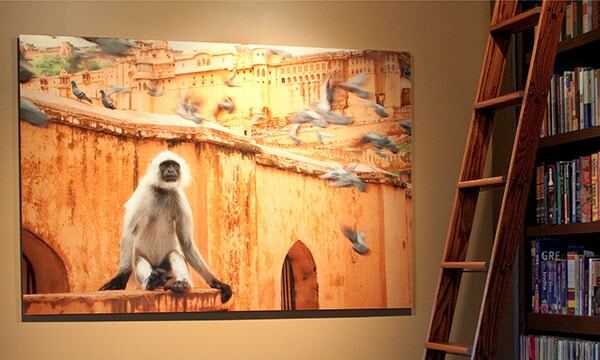 We can go up to a massive 96x48" though and you can contact us if you need a large acrylic print. It does depend on thickness though. 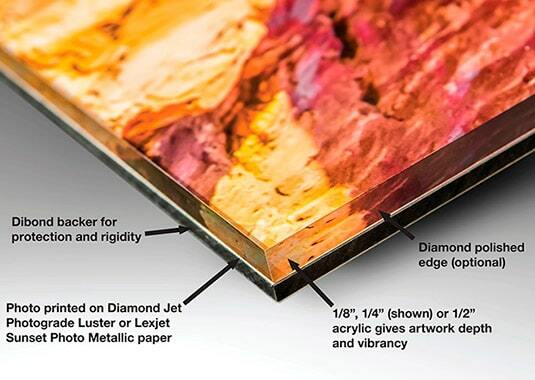 The 1/8" and 1/4" thick acrylic can go to 96x48" while the 1/2" acrylic maxes at 40x30". Absolutely, pricing includes the printing, mounting, floating/hang blocks and hanging hardware. No spending hours trying to figure out pricing here! ? See pricing table in tab to left. Pricing does not include shipping which is 10% of product price for pieces 40×30″ and below but we have a nice first order discount to take care of that and then some. If you're a repeat customer or reseller we have discounting options there too. 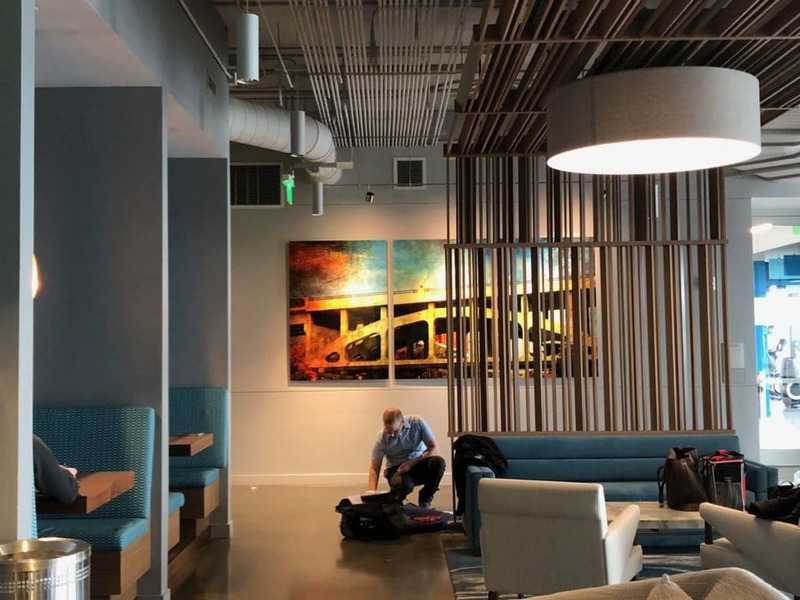 Does My Art Come Ready To Hang? You got it! The wood/wire hanging system is as easy as putting a drywall hook in your wall with no tools required. For large pieces and those wanting the more sleek aluminum subframe will get a french cleat system which involved a little bit more work but not too bad. We include the hardware and instructions to do that. Standard: production time for stocked sizes that can be ordered online is typically 4-6 business days. For custom sizes it's about 7-8 business days. Depending on what we have in the order queue sometimes orders can get out a day or two faster. Rush Production: we offer a rush production option at checkout online which gets your order out in 24-48 hours for a 25% charge (15% for reseller accounts). We may not be able to do this for very large orders so please contact us before placing a large rush order. Standard: standard ground shipping is 1-5 business days depending on where you're located from Seattle. So for example, orders going to WA, OR and ID can be as quick as overnight while orders going to the East Coast will need 5 business days. Rush Shipping: we offer expedited shipping options if you need them, but they can get expensive. For online orders, you have the choice of 3 day, 2 day and standard overnight shipping. If you need a different option such as Saturday or AM delivery contact us before placing the order and we can send you a custom pay link. TIP: Many of our customers are pro photographers with tight deadlines so we understand the need for delivery on specific dates. If you're unsure of the best option please contact us to discuss your project and deadline. We are flexible and can push orders out a bit faster if need be and possibly offer a reduced rush rate for large orders, etc. Do you need to order other products too? We recommend using our full configuration system to configure all products and checkout quickly. There is a lot of competition out there from companies that are very new to the process or using a machine made print direct to acrylic process (infuse ink into plastic). We have nearly a decade of experience and were one of the first companies in the USA to create world-class acrylic face mounted prints (1/8", 1/4", 1/2) and acrylic photo blocks (1") using a process that achieves exceptional vibrancy and a full color gamut (vs. direct to acrylic printing). Looking for 1" Acrylic Photo Blocks? We have these too! Great for desks and shelves. See details on our acrylic photo blocks here. NEW! Only At Bumblejax. 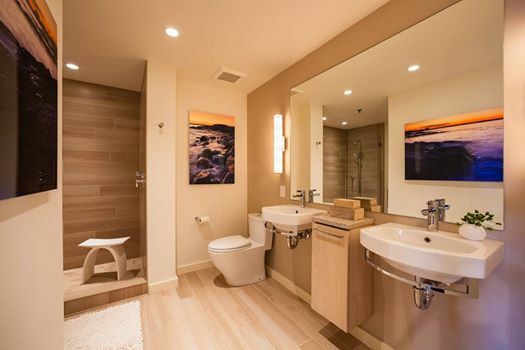 Check out our Acrylic Designer Series product. See details on our Acrylic Designer Series here.